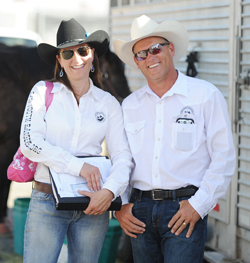 The 2014 Miss Days of the Old West royalty was announced Friday, July 4 before the standing-room-only third of three Days of the Old West rodeo shows at Hailey Rodeo Park. The young women played a big role in the Independence Day festivities and the 67th annual Hailey rodeo presented by the Sawtooth Rangers Riding Club. And, of the four girls picked for the royalty, two are from Hailey. Newly-named Senior Queen Kelli Lyn Ball, 16, daughter of Layne and Tamie Ball of Rexburg, was also overall high-point winner. The Sugar-Salem High School junior received a saddle from POWER Engineers, Sun Valley Window Cleaning and Finn Painting, plus a dozen roses from the Idaho Mountain Express for her queen win. Besides new Senior Queen Baxter, the new royalty featured Cara Malone, 16, of Jerome as Teen Queen; Emma Elaine Flolo, 13, of Hailey as Junior Queen; and her sister Kacie Anne Flolo, 9, of Hailey as PeeWee Queen. Freestyle Horsemanship winner was Cara Malone of Jerome. She received a headstall from Shoe & Tack Shop. Malone also swept the special categories in Teen Queen competition. Congenialty winner was first-time contestant Kailyn Bobbitt, 10, of Caldwell. She collected soap, candles, wallet and bracelets from Sun Valley Garden Center. Outgoing Days of the Old West royalty Mickenlie Baxter of Hansen, Kiffin Finn of Rigby, Zoie Pierce of Jerome and Brilee Hirschi of St. Anthony accepted flower bouquets from Clearwater Power Equipment, Upper Valley Vet Clinic, Taylor Chevrolet and Blincoe Architecture/Tula’s. Poise and Personality: Brandi Huizar (Senior Queen, hair products and earrings from Growing Concern Hair Design); Cara Malone (Teen Queen, lotion and manicure/pedicure gift from Cari’s Hair Care Tanning and Day Spa); Emma Flolo (Junior Queen, hair products and earrings from Annie Jones); and Kacie Flolo (PeeWee Queen, soap, candles, lavender and bracelets from Sun Valley Garden Center). Photogenics winners: Kelli Ball (Senior Queen); Cara Malone (Teen Queen); Emma Flolo (Junior Queen); and Kailyn Bobbitt (PeeWee Queen), all receiving picture frames from 5B Photo-Mike Beall. Speech: Winners were Brandi Huizar (Senior Queen); Cara Malone (Teen Queen); Bailey Cole (Junior Queen); and Kacie Flolo (PeeWee Queen), all receiving broaches from political candidates Dale Ewersen, Steve Miller, Vicki Heuett and Randy Patterson. Horsemanship: Saddle blankets went to these winners—Kelli Ball (Senior Queen, from Mountain Lifestyles Property Services); Cara Malone (Teen Queen, from Sun Valley Transfer & Storage); Emma Flolo (Junior Queen, from Valley Auto Body); and Kacie Flolo (PeeWee Queen, from Buffalo Electric). New Senior Queen Kelli Ball received a belt buckle from Mountain Lifestyles Property Services and River Sage Stables; silver bracelet from Ryan’s Mountain Rentals; sashe from Stone’s and Woody Smith Ford; feature turquoise earrings from Wood River Bookkeeping; Boulder Mountain necklace from Christophe & Co.; and $50 gift certificate from Blue Heron Workshop. First runner-up Brandi Huizar, 18, of Hansen received rhinestone necklace and earrings from Christopher & Co.; grooming tote from Rancher’s Supply; and saddle blanket from Riverside Boot & Supply. New Teen Queen Cara Malone earned a dozen roses from D-Swaner Welding and 5B Roofing; belt buckle from Professional Roofing/Alternative Color; silver bracelet from Sun Valley Auto Club; sashe from Valley Maintenance & Restoration; turquoise earrings from Wood River Bookkeeping; Boulder Mountain necklace from Christopher & Co.; and necklace from DL Custom Hay. First runner-up Kloie Pierce, 15, of Jerome received Doterra oils from Lazy H Spear Appaloosas; Scentsy bath and body works from Sandra Bobbitt; and a gift certificate for cinnamon rolls from Bellevue General Store. New Junior Queen Emma Flolo received a dozen roses from Wood River Welding; belt buckle from Branching Out and Sun Valley Rug & Tile; silver bracelet from Mountain Lifestyles Property Service and F-MTZ Construction; sashe from Robles Garden & Landscaping; earrings from Wood River Bookkeeping; Boulder Mountain necklace from Christopher & Co.; and $30 gift certificate from Trinh Nail Salon. First runner-up was Bailey Cole, 11, of Hailey. She won a $25 gift certificate from The Drug Store; cross necklace/earrings from Curt’s Corral; and cowboy boot toothpick holder from Wood River Bookkeeping. New PeeWee Queen Kacie Flolo received a dozen roses from Taft’s Design and Guffy’s; belt buckle from Mountain Lifestyles Property Services; silver bracelet from Valley Paint & Floor and Audio Innovation; sashe from Clint and Adrianne Godfrey; $25 gift certificate from The Drug Store; heart-shaped earrings from Wood River Bookkeeping; and Boulder Mountain necklace from Christopher & Co.
First runner-up was Kailyn Bobbitt. She won a cowboy boot toothpick holder from Lacy H Spear Appaloosas; Scentsy bath and body works from Sandra Bobbitt; and $25 gift certificate from The Drug Store.